You may have heard that WordPress is the most popular website builder platform, but maybe you aren’t sure if WordPress is the right choice for you. Unlike Wix, Weebly, or Squarespace, WordPress is actually 100% free. This is why if you searched for “WordPress review”, you would hardly find anything useful because bloggers often tend to write reviews for products that they earn a referral commission from. To help you make the right business decision, we have created the ultimate WordPress software review with pros and cons of using WordPress, so you can decide if WordPress is the right choice for your website. Because our WordPress review is extremely detailed, we have added a table of contents, so you can jump between different sections. What Kind of Websites You Can Make With WordPress? How Does WordPress Really Work? What Are The Pros and Cons of WordPress? Who Should Use WordPress? Is WordPress Right For You? WordPress is the world’s most popular website builder. It powers more than 31% of all websites on the internet, that’s millions of websites all over the world. It’s important that you don’t confuse the WordPress.org content management software with the WordPress.com blog hosting service. Our WordPress review is for the popular self-hosted WordPress software that everyone loves and use (not the WordPress.com hosting service). We recommend WordPress.org because it gives you full access to all WordPress features out of the box. For more details, see our side by side comparison of WordPress.com vs WordPress.org. From now onwards, when we say WordPress, we are talking about the free WordPress.org software. WordPress started as a simple blogging platform back in 2003. Since then it has evolved to become a content management system and an application development framework. In simple words, you can easily build any type of website using WordPress. To see how WordPress changed over the years, please see our article on the evolution of WordPress user interface. It is free as an in freedom. You can use it for any purpose, and no one can suspend your website due to censorship or a terms of service violation. You also have the freedom to customize WordPress to your needs without any restriction. But like all websites, you will need to register a domain name and web hosting. Based on your needs, you may have to purchase premium WordPress themes or extensions that will have additional costs. For a complete cost breakdown, see our article on the real cost of making a WordPress site. That being said, now let’s take a look at what you can do with WordPress and how does it actually work. 2. What Kind of Websites You Can Make With WordPress? WordPress is extremely flexible which is the main reason why it is a popular choice to build a website. You can use WordPress to build almost any kind of website imaginable! You can use it to start a blog, make a small business website, create an online store, build a membership site, sell online courses, run a marketplace, and more. No matter what kind of website you want to build, chances are that there is probably an existing WordPress plugin (extension) for that. In case, you don’t find a plugin, you can easily hire from thousands of developer to make it for you. Here’s a list of the most popular types of websites people are making with WordPress. 3. How Does WordPress Really Work? 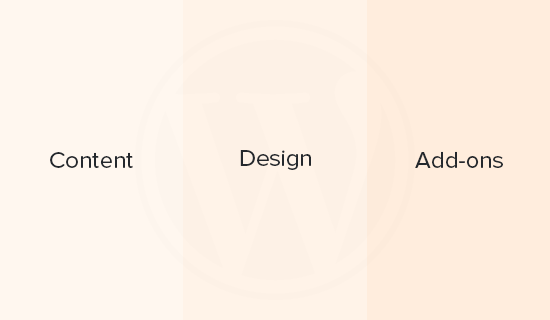 Unlike other website builders, WordPress keeps design, content, and functionality separated from each other. This allows for data portability. In other words, you can add content regardless of the design you are using, modify the design without changing your content, and add new features without affecting the other areas. Let’s dig deeper into that. WordPress stores content in a database and media files like images in a separate folder. Mainly you will be adding content to your website using the post editor. Post editor is a simple WYSIWYG editor with some basic formatting features. It comes in two forms. First, you have the Visual editor, which is a WYSIWYG style editor, and then you have the Text editor which is a plain text editor where you can add formatting by writing HTML in your content. 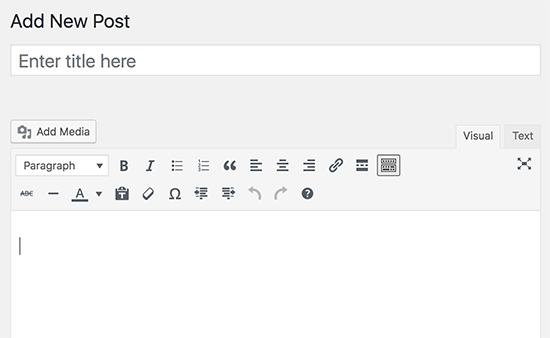 By default, WordPress content editor does not have any fancy drag and drop features to customize your content design as you write it. However you can use one of the popular WordPress drag and drop page builders should you need it. WordPress uses a powerful templating engine to manage the appearance of a website. This templating engine allows developers to create a set of templates called ‘Themes‘. 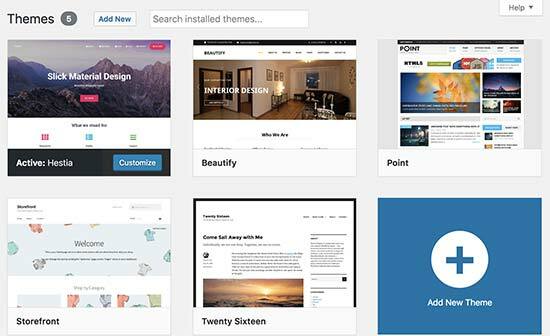 There are thousands of pre-made WordPress themes available in the market. Each WordPress theme comes with a stylesheet and basic template files to display different sections of a typical WordPress website. Depending on which theme you are using, it will come with its own settings which you can use to customize the appearance of a website. Some themes may have a lot more options than others. There are thousands of free and paid WordPress themes available that you can use to build a website. These themes allow you to use your own colors, layout combinations, and logos. You can also hire someone to create a custom WordPress theme from scratch, but it would cost significantly higher than using a free or premium WordPress theme. Alternatively, you can use a drag and drop page builder like BeaverBuilder or Divi to create a custom theme without hiring a developer. WordPress has become a platform for many developers to write their own add-ons for WordPress. These add-ons are called Plugins. Plugins are like apps for your WordPress site. Just like apps on your mobile phone, you can install WordPress plugins to add new features to your website. At the time of writing this article, there are more than 55,000 plugins available in WordPress.org plugins directory alone. This means if you can think of a feature for your website, then there is a very good chance that there is already a plugin for that. Some WordPress plugins are simple and only add a specific feature. Other plugins add a large set of features and functionalities. There are even WordPress plugins like WooCommerce, the most popular eCommerce solution, which have their own ecosystem of WooCommerce plugins and themes. Such plugins are like a platform built on top of the WordPress platform itself. To learn more see our article on WordPress plugins and how do they work. OptinMonster – the best way to get more email subscribers and sales from your website. 4. What Are The Pros and Cons of WordPress? Just like everything else in the world, WordPress has its own advantages and disadvantages which you may want to consider before making your website. The advantages of using WordPress to build your website deserve an entirely new article (See why you should use WordPress). Here is a summary of pros of using WordPress for your website. WordPress is free and gives you complete control of your website. You own and control all your website files and data. You are not tied to a web hosting company and can move your website anywhere you want. It gives you access to a huge collection of extensions, add-ons, and plugins to extend your website. This enormous access to professional applications allow you to make anything you want. You are in charge of your website, so you can keep it simple and only add new features as your website grows. You can make your website super fast and use all the neat SEO best practices to bring new users. Super easy to customize with thousands of website designs and templates to choose from. 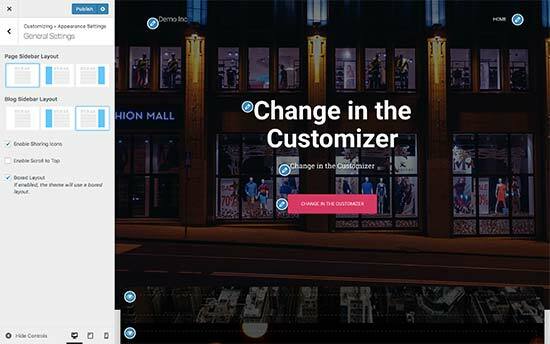 Each of them comes with different customization options, allowing you to create truly unique websites. Due to its popularity, almost all popular third-party tools already have integrations available for WordPress. So your email marketing software, lead generation tool, SEO tools, CRM software, and payment gateways will all work with WordPress. WordPress is not perfect. It has some disadvantages that you may want to keep in mind when choosing your platform. You are in charge of your website. This means you are also responsible for security, making backups, and installing updates. You can automate all these tasks, but they would still require your attention unless you’re using one of these managed WordPress hosting companies. WordPress does not come with a built-in drag and drop website builder. It takes some time for most beginners to get familiar with it and learn the basics. However you can use one of the popular drag and drop page builder plugins for WordPress. You do not need to learn coding to use WordPress. However, some basic knowledge of HTML and CSS will make things a lot easier. Most beginners acquire these basic skills as they use WordPress. 5. Who Should Use WordPress? Is WordPress Right For You? The beautiful part about WordPress is that it adapts to your needs. It can be as easy and simple as you want, or as complex and sophisticated as you need it to be. Since you are completely in charge and in full ownership, you can make things simple, control the cost, and efficiently run your website. Over the years, we have helped thousands of beginners learn WordPress, and we have seen them quickly graduate to the intermediate or even advanced level. If you agree with any of the above statements, then WordPress is the perfect platform for you to build a website. While we sincerely believe that WordPress is the best platform for anyone who wants to make a website, we understand that some users may not actually need WordPress, and would be fine with another solution. You just want to run a blog and have no plans to make money or use any third-party services. You are fine with limited features as far as you never have to write code, make backups, or worry about updates. You just want a small website, and you are not worried about growing your business online or using the website to make more sells. If you agree with any of these statements, then you can use another platform. See our list of best blogging platforms and website builders to find a platform that may suit your needs. To start a self-hosted WordPress.org website, you will need to register a domain name and purchase website hosting. We recommend using Bluehost. They are offering our readers a FREE domain name + free SSL + 60% discount on WordPress hosting. Which means you can start your website for as low as $2.75 per month. Bluehost is one of the largest hosting companies in the world, and they are an officially recommended WordPress hosting provider. Once you have purchased hosting, head over to our guide on how to make a website for step by step instructions. While WordPress is easy to use, you may want to ask a question or need some help every now and again. The good news is that there are plenty of free resources to help you with that. WPBeginner itself is the largest free WordPress resource site for beginners. Here are our resources that you can use to learn WordPress (all of them are completely free). WPBeginner Blog – This is where we regularly publish new WordPress tutorials and how-to guides. WPBeginner on YouTube – Need more video instructions? Subscribe to our YouTube channel with more than 100,000 subscribers and 10 Million+ views. WPBeginner Dictionary – Familiarize your self with the WordPress lingo and improve your WordPress skills. If you have a WordPress specific question, then you can also reach out to us using our contact form. 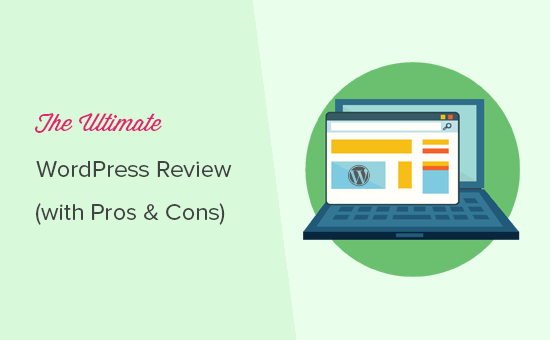 We hope this WordPress review helped you understand the pros and cons of using WordPress. You may also want to see these actionable tips to bring more traffic to your new website.